In this week’s Pearls of Wisdom blog post, meet 3X cancer survivor and 2X co-survivor, Greg Pierce. Greg is the Community Manager for cancer support site WhatNext. He is involved in the American Cancer Society’s Heroes of Hope program and Rely for Life. He plays with his band Storm Angels to raise money for cancer research and individuals impacted by cancer. Hear from Greg about his fights with cancer and how his experiences inspired him to give back. In 1988 while at a routine doctor’s visit for allergies, the doc asks, “How long have you had that lump in your neck?” This was the beginning of my 27 year journey with cancer.This lump that I didn’t even know I had turned out to be Hodgkin’s disease. After two years of treatment that included seven operations, chemotherapy, radiation, stays in the hospital, one relapse, and more chemotherapy, my oncologist finally says, “We think you’re in good shape.” After these first two bouts with cancer, I was lucky enough to stay clean and cancer free for 18 years. A little over six years ago, I woke up one morning and felt a sore spot behind my ear. I knew what this was. Only it was a different kind this time, squamous cell carcinoma of the tonsil. Who ever heard of a malignant tonsil? Here we go again, I thought. This time included two very painful operations, a tonsillectomy (a souped-up version where they cut a hole in your throat) then a radical neck dissection, and, oh yeah, a colonoscopy to take out precancerous polyps. Radiation came next, and it appears to have done the job. After 6 years, I am still cancer free. My biggest issue since treatment has been fighting all the side effects. I lost all my teeth due to the lingering side effects of radiation. The radiation killed my saliva glands, and dry mouth=teeth gone. All my teeth had to be surgically removed due to the risk of getting osteoradionecrosis, a condition where the gums will not heal after tooth extraction, due to previous radiation. I was fortunate enough to make it through this without that issue. The doctors and nurses at Vanderbilt University Medical Center have taken great care of me. Another side effect of the radiation was an occluded carotid artery in the right side of my neck that caused me to have a TIA (mini-stroke) 2 years ago. Cancer, it’s the gift that just keeps on giving. I had to have stents put in my neck to keep the blood flowing to my brain. So far, that has kept me in good shape! Other side effects that I still deal with every day include neuropathy, chemo brain, soreness, aches and pains, chronic cramps in my neck from the surgery, and difficulty swallowing due to surgery and radiation. But, all of these side effects are just the price I pay to still be here today. I often say that while having cancer three times was no fun, and the side effects of treatment and surgery over 27 years have taken their toll, it’s still better than the ONE side effect from not doing anything about your cancer and not fighting back death. I don’t care to meet that side effect just yet! As it turns out, attacking me three times wasn’t good enough for cancer. While taking my father to his routine doctor’s visits eighteen years ago, we learned he had prostate cancer. The doctors told us, “Don’t worry. It will never get you. You’ll die of something else long before the prostate cancer gets you.” The doctors were wrong. We watched him slowly drift away in 2010. Two months after putting Dad to rest, we take Mom to the doctor to find out her persistent cough was an inoperable lung tumor.We watched her follow in Dad’s footsteps, slowly withering away. Lung cancer took her on January 4, 2011 about 10 months after Dad passed away. I can take cancer hitting me once, twice, even three times. I can take it. I feel certain my diagnoses have been harder on my dear, sweet wife of 35 years than they was on me. With Donna by my side, I made it through. However, after cancer took Mom and Dad in the same year, I feel like it’s time to fight back. 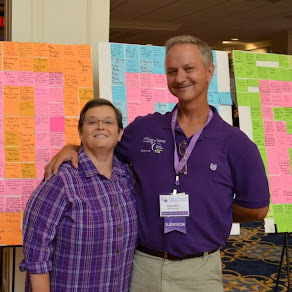 Donna and I are active supporters of Relay for Life of Henry County in Paris, TN and continue to do what we can to raise money for research and patient/survivor benefits and programs. I can’t write a big enough check to give scientists enough funding to find a cure, but I can play music fairly well. I play in a band called Storm Angels.Cancer has touched all of us in the band either directly or through a family member. We are all committed to helping the cause in the fight against cancer. We have played at benefits to support Relay For Life and individuals touched by cancer. We are proud to do it! The Storm Angels will play another benefit for Henry County’s Relay For Life on May 16, 2015 at Meo Mio’s Cajun Seafood Restaurant at Paris Landing. The event is called Ribs, Ridin’ & Rockin’ for Relay. Visit the Facebook page for more information about the event. I am honored to be a Hero of Hope speaker for the American Cancer Society. I routinely speak to groups that are involved with Relay for Life and individuals that have been impacted by cancer. I personally benefited from the programs and research provided by the American Cancer Society and the research done at Vanderbilt University Medical Center. Donna and I are happy to help raise money for more research. Who knows? The next $1,000.00 may be what it takes to find the cure. Two years ago, I became the Community Mgr./ Social Media Mgr. for the cancer support site WhatNext. The site helps cancer survivors get through their diagnosis, treatment, and side effects of cancer. I spend many hours a day helping those who are in search of information and support. My message to anyone recently diagnosed with cancer stay calm, research your cancer, ask questions of your medical team, be your own advocate, and above all, stay positive and never give up!